I've put together some posts on some of the small, probably only important to me, collections that I have. Many of which arose out of thin air. But that's not true for this one. I love coffee. I'll admit I'm a snob about it from time to time. But I'll argue that good coffee is good. Like good wine, good cheese or good craft beer. It's worth the money, it's worth walking the extra blocks to a place that won't serve you soap suds for $4. Silky, creamy, smooth micro foam lattes, cold-brewed iced coffee and just beautiful fresh drip coffee (at L'Aroma, Flat Black, Espresso Royale, Simon's Coffee Shop and 1369 in the Boston area). I love all the ways there are to make coffee - without a terrible plastic countertop-disgracing electric machine. Being so many, it makes me wonder how we (hello, product designers) ended up ever moving past these devices. They already did the job, and I'd argue they're not any harder than an electric device. The only disadvantage I can see is that they may take a little longer, but I think that's negligible and, far more importantly, they look so much better. Who really celebrates the form and function of a Mr. Coffee? After the jump I'll go through the kinds I have and the way they make coffee. These look like you might find them in a lab, and rightly so - they were invited by a scientist. It's an hour-glass shaped jug with a spout and wooden belt. A paper filter (or fabric; I'll post on that another time!) goes in the top, then you add your grounds, then add boiling water. Below, your jug fills up with coffee. With this kind of drip coffee, you want to use just enough water to soak the grinds on your first pour (grinds should be ground for drip) and let the water completely drip through. Then continue with the rest of your water, filling up the top, letting it drip some, filling it again until your water is used up. When finished, remove the filter with the grinds and, holding the jug from the wooden belt (protecting your hands from the heat), serve! I found this one at a yard sale for $8. 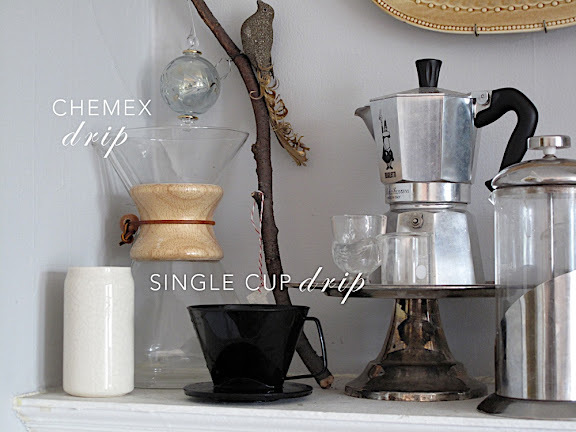 The single-cup drip works in the same way as the Chemex, but fits nicely on top of one coffee cup. This is what I use most often. I have one at home and one at my desk at work. It looks almost like a cup itself but has holes at the bottom and a wide ring so that it can sit on top of a range of mugs. Again, you put a filter* in the top, followed by the grinds (again, for drip). Place the drip cup on top of your coffee mug and add water in the same fashion as you would the chemex: first cover the grounds and let all water run through, then continue to fill and drip until you've filled up your cup (I usually have to lift up the drip cup to check and see how much or how little water I need before I overflow). When you're finished you have one cup of coffee ready and very little to clean up afterward. I toss the filter and just rinse out the drip cup. The two I have are plastic but there are some lovely porcelain ones available, too. I bought mine from the hardware store. *Filters are readily available for these, and Chemex filters aren't too hard to find either (but if you use fabric, you don't have to worry about that). This is a classic. They come in many sizes; mine makes one cup of coffee and takes hardly any time. Unscrew the top from the bottom and fill the bottom with water. Fill the filter with coffee (ground from drip to fine, but not espresso fine; portions mentioned below) and insert it on top of the bottom piece. Screw back on the top and heat on the stove on medium heat. The water in the bottom starts to boil and is pushed through the filter and the grinds and up to the top. When it's done brewing, the top will be full. Try to not let it heat long after it's finished brewing. Serve! A note about these - use soap as little as possible when cleaning. Aluminum can take on the flavors of things it comes in contact with and you'll want your coffee to not taste like your soap (I'm guessing). If you wash the parts not long after you've used it, you'll be okay, in my experience. This is my second or third one in life, and it came from Polcari's coffee and spice store in Boston's North end. Presses make a lovely cup of coffee. With presses, the grounds soaked in water and are then separated with a filter, compared to the other methods here where the grounds only meet the water briefly. Add your coffee to the beaker, then add water. Place the plunge press on top, letting it sit on the top of the floating grounds. In four minutes, plunge the filter down and pour. Coffee makers that use metal filters instead of fabric or paper allow for the oils of the coffee beans to make it to the cup your serve, which gives a great flavor. The is also not my first one in life and I think I actually got it at TJ Maxx while in a rush to have some way to make coffee when I first moved into my place here. 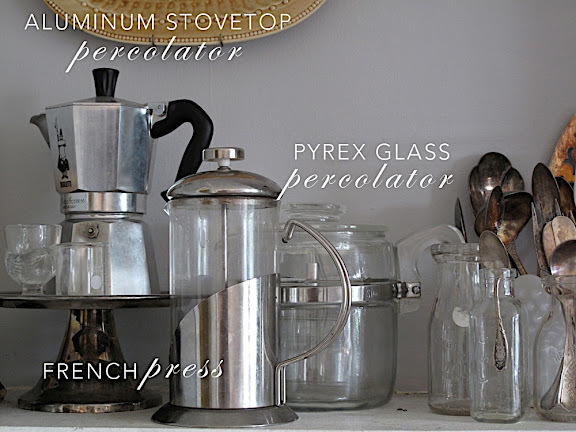 This percolator works a little like the stovetop percolator, but its parts are organized a little differently so the water does not transfer from one container to the other; it cycles. And because it's glass you can watch everything happen. Insert your tube, large open side down, into the pot. Fill your coffee container with coffee and slip it onto the tube. Add water and put the top on and heat. Some sources say to let the water boil first, and then add the coffee container, some do not, and since the latter involves less risk of burning I go with this. It takes just about 4-6 minutes from the time the water boils and the first drop of coffee cycles to brew the pot. After the time has elapsed, take it off the stove and pour. I bought this at Brimfield last year for $30 and feel like I got a pretty good deal; a nice one with all its parts can sell for $10-$15 more. Finally, this percolator works just like the Pyrex percolator, only it's made of stainless steel and you can put it over a campfire. I bought this at a Salvation Army for maybe $4, it's in great shape and has all of its parts including the clear percolator cap on top. I stick to the standard: 2 tablespoons (1/8 cup) of grounds per serving. The part to remember is that a "serving" is considered to be 8-10 ounces which is smaller than a Starbucks tall. I prefer a smaller portion and so I stick to this, but if you want to make larger cups you'll need to take this into account. Anyways, if you're at my place, you never have to worry about coffee. And, full disclosure, I do have one electric maker - it's an espresso machine; though it's on its last leg of pulling a good shot, it still great for steaming milk. Lovely! So which one do you use most often? I use the single cup drip nearly everyday at home and at work. 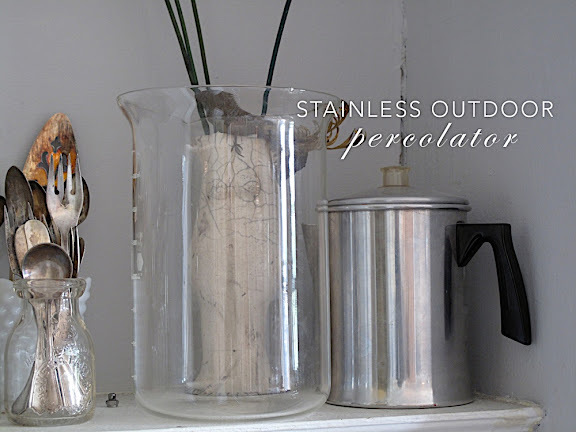 I also often use the aluminum percolator because it just makes one cup. If there is me and another person I use the press; multiple people I use the Chemex or Pyrex Percolator. love love love this! i manage a coffee shop in atlanta so i have quite the collection of brewing methods as well! thanks for sharing! These are cute - and I do love my French Press - but don't hate on Mr. Coffee! Mine has a "delayed brew" option, so I can put in the (freshly ground, fair trade, etc. etc) grounds and water the night before and wake up to the delicious aroma of brewing coffee. Better than an alarm clock! How in the world do you have enough room in your apartment for 6 different coffee apparatuses? I just drink diet coke so I can throw away the can and leave my spartan existence unchanged. Little do you know, that's not the half of the things I find room for in 370 sf! Sometimes I take time to just think, "how can I get more from this space?" Buckets of fun! We own an electric percolator, it was a gift. However, we actually use a cafetiere or a stove top percolator, each of which we have two sized of.